It is not often one comes away absolutely mesmerised from talking to a person, but such was our experience on this day. 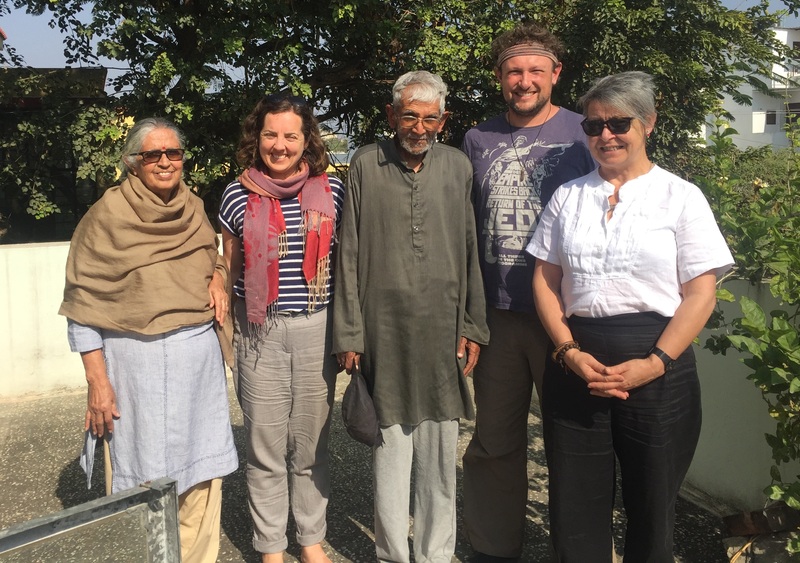 On day seven of our CERES Global Sustainable Development, Permanent Culture and Un-learning tour to India, a small number of our group visited with Kishore Saint, a retired geographer and friend of Shikshantar. Kishore-ji shared with us some of his life experiences living in Africa, the United States and the United Kingdom, reflected on insights into community he gained from interacting with tribal peoples in Rajasthan, and concluded with an exhortation for us to change the world by looking within ourselves. Kishore-ji opened our discussion with what he described as his ultimate existential question—“who are we really?”—and went on to describe the “stories within stories” that made up the many identities he has assumed over the nine decades of his lifetime. Kishore-ji grew up in Brahmin family in Punjab, on what would later become the Pakistani side of the partition. A geographer by profession, he completed a degree in Geography at Hull University in Britain, followed by higher degree studies at Oxford University and Birmingham University. In 1947 he moved to Kenya, where he worked in the education sector in the British colonial administration for 18 years. He was forced to leave Kenya during that country’s decolonisation period in the late-1960s as the fledgling government attempted to “Africanise” the Kenyan public service with local administrators. From Kenya, Kishore-ji moved to New York in the United States, where he was involved in the social ferment of the time and witnessed the birth of the modern social movements that have shaped political discourses in the West ever since. He spent two stints of three months in Cuenavarca province of southern Mexico at a state-run developmental precinct called CIVAC (“Ciudad Industrial del Valle de Cuernavaca,” or “Industrial City of the Cuernavaca Valley” in English), developing education programs beyond institutions and conventional schooling. In 1972 Kishore-gi returned to India to work with the government on forestry in Rajasthan, working with local tribal peoples in the mountainous areas surrounding Udaipur. Kishore-ji worked in a role that brought him into contact with the tribal peoples of the Udaipur region. The government saw the forest as a resource to be exploited for commercial gain, which, exacerbated by official corruption, accelerated deforestation by commoditising a common resource that desperate people attempted to eek a living from. In his discussions with tribal leaders, Kishore-ji explained that even though the original deforestation was caused by larger forces beyond their control, the logging practices of the tribal communities were accelerating deforestation and destroying their future. However, these communities were facing drought and famine conditions at the time, and were surviving by cutting down trees to sell as firewood. The social role of the tribal peoples in the famine economy of the time was further enabled by government policy. The forests around Udaipur only became deforested after 1950, when the government took over administration of the forests, which were previously cared for as a community commons. There is a powerful lesson in this story about the folly of individualising responsibility for systemic problems and of bureaucracies talking at people facing impossible existential choices. Through these interactions, Kishore-ji discovered that the tribal peoples had a very rich culture and were indeed more “civilised” than the urban dwellers, if we define civilisation through the lens of people care. As Gandhi observed, the sense of the common (between people and nature) and the sense of community (relationships between people) lay at the heart of this culture, which was not governed by the caste system. He found a sense of the sacred in these relationships, in which nature and people were valued intrinsically instead of as resources to be exploited. Wendy, Sarah, Sebastian (behind camera) and Ben meet with Kishore Saint and his wife. For Kishore-gi, the education system needs to recover the ethics of love, care and mutual help. Education needs to think beyond current institutions to integrate critiques of mainstream development with politics, economy and ecology. He see the most interesting integrative work being done in Bolivia through the incorporation of indigenous peoples’ wisdom in “Rights of Mother Earth” initiative. In true Gandhian fashion, He also argued that any emancipatory movement needs to foster active pockets of cultures of non-violence, based on principles of love, care and mutual help in relation to nature and people. In his most moving statement, he urged us to start with reflective practice—“are we non-violent within ourselves?”—to find the source of truth within ourselves. A broad social movement of self-discovery is most likely to foster the culture of love, care and mutual help that is required to meet the demands of our historic moment.